The Detroit River is a 24-nautical-mile-long (44 km; 28 mi) river in the Great Lakes system. The name comes from the French Rivière du Détroit, which translates literally as River of the Strait. The Detroit River has served an important role in the history of Detroit and is one of the busiest waterways in the world. The river travels west and south from Lake St. Clair to Lake Erie, and the whole river carries the international border between Canada and the United States. The river divides the major metropolitan areas of Detroit, Michigan and Windsor, Ontario — an area referred to as Detroit–Windsor. The two are connected by the Ambassador Bridge and the Detroit–Windsor Tunnel. The river serves as an important transportation route connecting Lake Michigan, Huron, and Superior to the St. Lawrence Seaway and Erie Canal. When Detroit underwent rapid industrialization at the turn of the 20th century, the Detroit River became notoriously polluted and toxic. In recent years, however, the ecological importance of the river has warranted a vast restoration effort, and the river today has a wide variety of economical and recreational uses. There are numerous islands in the Detroit River, and much of the lower portion of the river is incorporated into the Detroit River International Wildlife Refuge. The portion of the river in the city of Detroit has been organized into the Detroit International Riverfront and the William G. Milliken State Park and Harbor. The Detroit River is designated an American Heritage River and a Canadian Heritage River — the only river to have this dual designation. The Detroit River flows for 24 nautical miles (44 km; 28 mi) from Lake St. Clair to Lake Erie. By definition, this classifies it as both a river and a strait — a strait being a narrow passageway connecting two large bodies of water. That is why the river was originally called the River of the Strait by early French settlers. However, today, the Detroit River is rarely referred to as a strait, because bodies of water referred to as straits are typically much wider. The Detroit River is only 0.5 to 2.5 miles (0.80 to 4.02 km) wide. The Detroit River starts on an east to west flow but then bends and runs north to south. The deepest portion of the Detroit River is 53 feet (16 m) deep in the northern portion of the river. At its source, the river is at an elevation of 574 feet (175 m) above sea level. The river drops only three feet before entering into Lake Erie at 571 feet (174 m). As the river contains no dams and no locks, it is easily navigable by even the smallest of vessels. The watershed basin for the Detroit River is approximately 700 square miles (1,800 km2). Since the river is fairly short, it has few tributaries. Its largest tributary is the River Rouge in Michigan, which is actually four times longer than the Detroit River and contains most of the basin. The only other major American tributary to the Detroit River is the much smaller Ecorse River. Tributaries on the Canadian side include Little Creek and the River Canard. The discharge for the Detroit River is relatively high for a river of its size. The river’s average discharge is approximately 188,000 cubic feet per second (5,324 m³/s), and the river’s flow is constant. The Detroit River forms a major element of the international border between the United States and Canada. The river on the American side is all under the jurisdiction of Wayne County, Michigan, and the Canadian side is under the administration of Essex County, Ontario. The largest city along the Detroit River is Detroit, and most of the population along the river lives in Michigan. The Detroit River has only two automobile traffic crossings connecting the United States and Canada: the Ambassador Bridge and the Detroit–Windsor Tunnel. Both of these are heavily protected by the U.S. Customs and Border Protection and the Canada Border Services Agency. The upper portion of the river is one of the few places where a Canadian city lies directly south of an American city. In this case, the city of Detroit is directly north of the city of Windsor, Ontario. The only other location where this occurs is Fort Erie, Ontario, lying south of several cities in Niagara County, New York. The cities and communities southwest of Detroit along the American side of the river are popularly referred to as the Downriver area, because those areas are said to be “down the river” from Detroit. 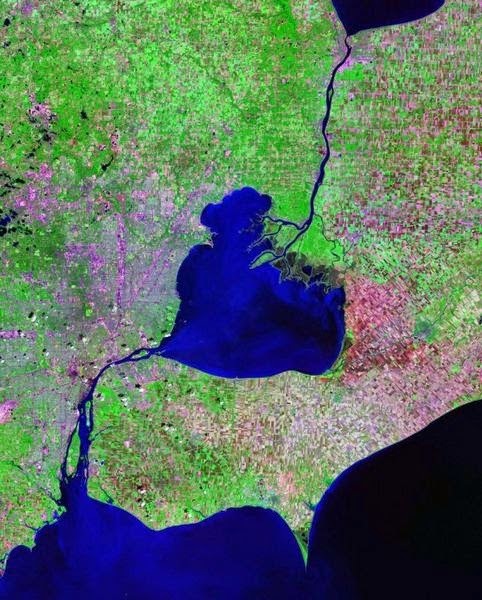 Several of these communities do not actually border the Detroit River; the term “Downriver” is used to refer to a cluster of 18 suburban communities that lie to the southwest of the city of Detroit and to the west of the Detroit River. The Detroit River contains numerous islands. Ownership and control of the islands varies by their geographic location along the river. The majority of islands are on the American side of the river. There are no islands in the Detroit River that are divided by the international border. Many of the islands are very small and uninhabited. Most of the islands in the Detroit River are in the southern portion of the waterway near Grosse Ile and close to where the river empties into Lake Erie. Belle Isle, in the northern section of the river, is entirely used as a Detroit city park, and is open to the public via a bridge connection with the city.